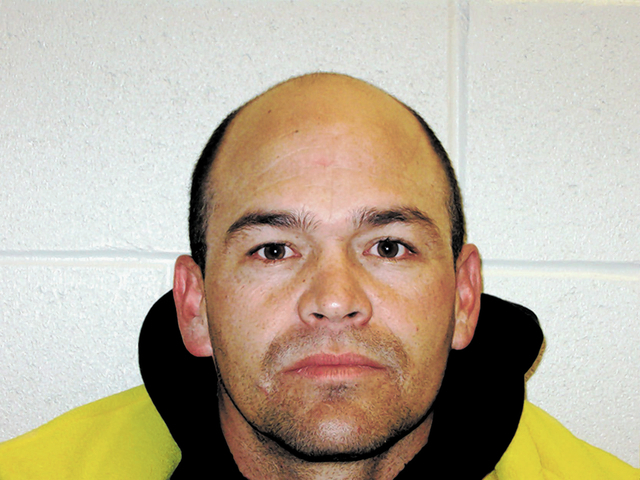 A Nye County Sheriff’s deputy was arrested Thursday evening after he allegedly broke into his estranged wife’s home and held her captive there. NCSO Deputy Royce Avena was taken into custody on charges of domestic battery, stalking, burglary and false imprisonment after police received a report of a domestic battery around 6:10 p.m. The victim in the case told deputies that around 4:30 p.m., Avena, whom she is legally separated from and currently in the process of divorcing, came to her home uninvited and began banging on the front door. The woman said Avena then went to the back of the home and forced the sliding glass door open and entered the residence. A report from the sheriff’s office notes Avena and the victim live in separate homes and that he does not have keys to the victim’s residence nor is his name on her lease agreement. After entering the residence, the woman told police Avena confronted her about being with another man before physically forcing her into the master bedroom. According to police, the victim even struck her estranged husband in the face in an attempt to get away. Sources tell the Pahrump Valley Times that a man with the victim at the time of the incident was able to flee the home after hiding in a kitchen pantry. Avena allegedly later confronted this person at his place of employment. Police noted that the couple’s children were in the home at the time of the incident as well and could allegedly hear their mother yelling for help. Eventually, Avena left the residence on his own. When he was later confronted about the allegations by a superior at the sheriff’s office, Avena allegedly admitted that he had entered the victim’s residence and that she had struck him in the face. Police noted this may not be the first such incident between the couple. The victim allegedly told investigating deputies that Avena had previously gone to her place of work and prevented her from entering her car by shielding her from it. She also said on a previous occasion that Avena had come to her residence uninvited and forced his way inside. The woman said she didn’t report the incident at the time because she didn’t want to jeopardize his job as a deputy, but this time she feared for her safety and decided to report the behavior. Avena was placed under arrest and transported to the Nye County Detention Center where he was booked into custody in lieu of $10,500. He later posted bail and was released from custody. The victim in the case reportedly filed a temporary protection order against Avena with the Pahrump Justice Court on Friday. It was granted Monday by Beatty Justice of the Peace Gus Sullivan. Sheriff Tony DeMeo said Avena has been placed on paid administrative leave pending criminal and internal investigations surrounding the incident. Avena’s NCSO issued property was seized as well. The sheriff said by law the deputy must receive pay until the completion of the investigations. If the allegations against the deputy are sustained, he could lose his job as well as his certification as a Nevada law enforcement officer. “In situations like these, it’s our duty as law enforcement to ensure the safety of the victim and the public. We have to maintain the deputy’s rights, but my responsibility as the sheriff, and what I ordered, is that he be put on mandatory leave,” DeMeo said.